Hey, hey! Who's excited that it's Saturday? Me, this girl right here. I'm in South Bend right now commencing my weekend with a bit of errand-running. First stop? The new Einstein Bros. bagel shop. I don't usually go for the bagels, but we'll see. I also have big plans for Border's. This 'ol friend of mine is closing up. So sad. Are you losing a Border's? Wherever will you buy your books? I haven't figured that one out yet. Perhaps I'll go to the little guy in my small, tiny town. It never hurts to support the little guy, right? And that's why I'm going to check out some small health foods stores in South Bend, too. Mom reminded me of one I haven't been to since I was little. Fingers crossed for most excellent foodie finds! I also have to get some new makeup, and...well, I won't bore you. This is what you might call an Xertube, and you can find them online at a variety of different places. Many fitness professionals shop at SPRI, and I think it might be one of the resources we use at the gym. One tube'll run you around $10, but you can often find sets at the store for a much cheaper single-unit price. And quite often, those sets come with a DVD or handy little storage bag. But you can't just buy any 'ol band and expect it to work the way you want it to. There are things to be considered, friends! First, take a look at the handles in the picture above. Note that the handles are padded, which doesn't really make a difference but is a nice little bonus. Now focus on the way the band attaches to the handle. This connection should always be extremely secure. It should not provide any room for slipping whatsoever. Slipping bands are annoying, and they mess with levels of difficulty. Speaking of difficulty, you'll need more than one band as different muscle groups require different resistances. 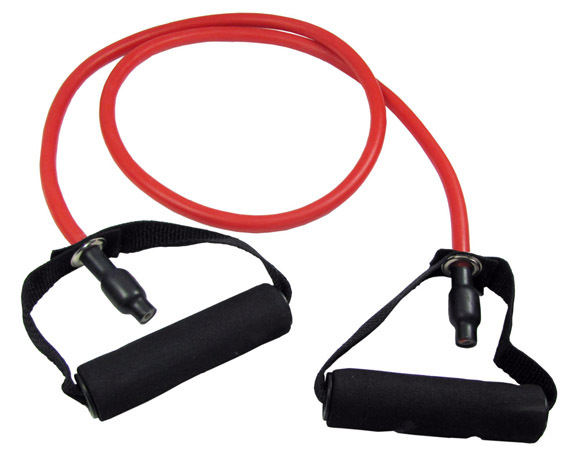 And different bands offer different resistances. Consider getting a Light, Medium and Heavy band. And if you plan to step on them (for biceps curls or squats with a shoulder press), consider getting one with a sleeve. Your shoes can dig into the rubber, subsequently ripping the rubber which renders the entire thing useless. And a useless exercise band doesn't do anyone a single ounce of good. But if you don't want to spring for the sleeve, just keep an eye on your bands and purchase new ones at the slightest indication of wear and potential tear. Now, you might be wondering why my own personal bands don't have handles. Handles make everything a bit more comfortable, but that's not to say I can't do handle-specific exercises with mine. I can. I just have to get a really good grip first. Let's be honest—I prefer the version with handles. But I make do when I have to. While these are all very fun to play with, I am of the belief that anything you can do with these can be done with one of the two models above. You just might have to tie a tight knot to achieve the full-circle effect. Don't ya think? I do. I also think these homemade wheat thins are downright tasty. I know, completely off the topic at hand but very worthy of a mention. I love me some wheat thins, but I don't love the ingredients included in the boxed variety. This is obviously a welcomed change. And once again, I got the recipe from Angela at Oh She Glows. Girl has got some serious skillz in the kitchen! Question: Do you own exercise bands? What is your favorite way to use them? And for giggles, I'd also like to know what your favorite cracker is. EPIC FAIL: I cannot make almond butter. Words can't express. Except when they can. DOMS, and my attempt to cure it with juice. WIN THIS: A sampler pack of Chobani yogurt! WIN THIS: A loose leaf tea glass from Libre Tea! When the hubby is away, the wifey will play! The 7 Facts Blog Award (and some link love).